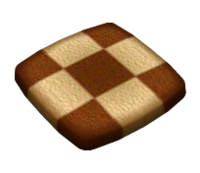 This article is about the smaller checkerboard cookie. For the larger one, see Succulent Mattress. The Comfort Cookie (ざぶとんクッキー?, lit. : "Cushion Cookie") is a treasure found in Pikmin 2. It is actually a small marble cookie. It is found on the second sublevel in the Submerged Castle, inside the body of an adult Bulbmin. It is tied for the least valuable treasure. The Comfort Cookie being analyzed. Marble cookies from the real world. The Comfort Cookie resembles a Yoshi Cookie from the game Yoshi's Cookie. This page was last edited on December 29, 2018, at 12:50.